Wind energy is the most cost competitive renewable energy source. Onshore wind energy in particular is cheaper than any other renewable energy and it is competitive with conventional power generation sources such as coal and gas. According to the European Commission, the levelised cost of electricity (LCOE) of onshore wind ranges from €52 to €110/MWh. When taking into consideration pollution costs and subsidies, which are not included in LCOE estimations, onshore wind is the cheapest generation source in Europe. Offshore wind is on a steady cost reduction pathway with expected costs of €100/MWh by 2020 and €85 to €79/MWh by 2025 depending on projects pipeline. Approximately 75% of the total cost of energy for a wind energy project is related to upfront costs such as the cost of the wind turbine, foundations, electrical equipment and grid connection. Operation costs on the other hand are very small compared to fossil fuel technologies where as much as 40-70% of costs are related to fuel and operation and maintenance (O&M) for their entire lifetime. The typical lifetime of a wind farm is 20 years, although there are projects in the EU that have been operating for more time. Extending life of wind farms is an active area of research. Repowering existing projects with newer, scaled up technologies is also an important strategy in the long-term to improve cost competitiveness. Wind power is one of the fastest growing industrial segments in the world. Starting off as a niche market 15 years ago in Europe, wind energy today can meet 11.4 % of Europe’s electricity demand with a cumulative capacity of 142 GW at the end of 2015. In 2015, the wind energy industry installed 12.8 GW in the EU – more than gas and coal combined. Wind is set to be the backbone of the future power system. It is poised to meet a quarter of Europe’s power demand by 2030. The IEA’s World Energy Outlook predicts it to be the leading source of electricity generation in 2040. The European wind energy industry’s vision to 2030 is to install 320 GW of wind energy capacity in the EU by 2030, 254 GW of onshore wind and 66 GW of offshore wind. That would be more than twice as in 2015 and an increase of two thirds from the expected capacity installed by 2020 (192 GW). Wind energy could produce 778 TWh of electricity, equal to 24.4% of the EU’s electricity demand. 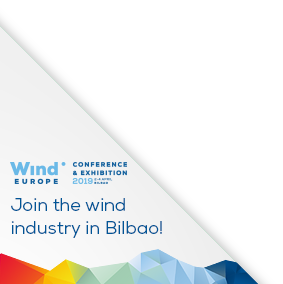 The wind energy industry would provide over 334,000 direct and indirect jobs in the EU and wind energy installations in 2030 would be worth €474 bn. The 96,000 wind turbines installed on land and in the sea would avoid the emission of 436 million of tonnes (Mt) of CO2, equivalent to 164.5 million cars. Wind energy is ready to deliver even more benefits in Europe. The extra rewards of taking a more progressive growth pathway in wind energy deployment to 2030 are significant. With 392 GW installed to 2030, wind energy could be the biggest power generation source in Europe, ahead of coal and gas generation. WindEurope estimates that 53.7% of electricity consumed in Europe will be sourced by renewable energy technologies, with wind accounting for 28.2% of total electricity demand. This would remove 111.6 Mt CO2 by not postponing climate mitigation actions to the next generation. This would be a net positive for the EU economy with an additional €13 bn GDP resulting from the increased deployment of wind and other renewables. The transformation of the energy mix will also lead to a net job creation in the European Union with 366,000 direct and indirect jobs in the wind industry alone. Wind energy’s potential to 2030 and beyond will largely depend on more ambition from policy makers. To this end, a robust governance system should be agreed to ensure Member States collectively deliver on the 2030 binding renewable energy target and are rewarded for additional ambition.